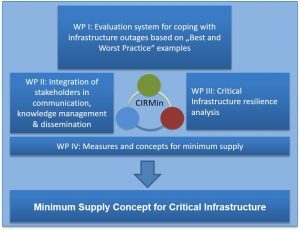 The most important scientific and practical goal of the project is to provide a proportionate and realistic minimum supply concept for electricity and water in the wake of a power failure and the associated loss of water supply as well as other critical infrastructures (e.g. transport and communication). A prolonged outage of the power supply can have far-reaching effects on other critical infrastructures too. Despite the legal requirements for the drinking water supply in crisis situations it can be assumed that, in particular in rural areas of Germany, bottlenecks in the supply of drinking water and sanitation can occur. While different triggers for a black out are imaginable, there are scenarios which can be deduced from the past in Germany (in the context of extreme weather events). These events (e.g. Storm Kyrill and Ela, hurricanes Xynthia and Christian), show a vulnerability of important systems and economic damages into billions and underline the changed requirements on emergency services.